A black and white negative of a portrait of William Henry James. William Henry James was born at Coedporth, North Wales, on 7 December 1892. He served in the First World War with the 19th Battalion of the Canadian Infantry, and was one of the trustees of the Whitby Great War Veterans Association that built the Cenotaph in 1924. He was a charter member of the Royal Canadian Legion Branch 112 and was President in 1928-29 and 1948-49. He served as a chairman of the Whitby Street Fair in the 1930s when it was sponsored by the Rotary Club and the Legion. 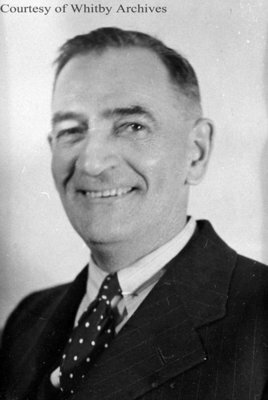 Mr. James was chairman of the Whitby Citizens' Rehabilitation Committee in 1943 and a member of the committee that built the Whitby Legion Hall in 1943-44. He was a foreman at General Motors of Canada, where he worked from 1919 until 1959. Mr. James was also a member of Composite Lodge No. 30, AF and AM. He died at Whitby on 8 February 1978 and was cremated. William Henry James, 1949, Photographer Unknown. Whitby Archives A2016_017_028A.